As a Senior master Trainer for YogaFit® systems Worldwide, Mary has trained over a thousand yoga instructors throughout the United States in the Vinyasa (flow-based) style of yoga. Her current passion is the warrior program through YogaFit®, focusing on helping our military, their families and others effected by PTSD. She has also developed her own workshops over the years including a popular Partner Yoga Workshop on the OM of Yoga and Wine. 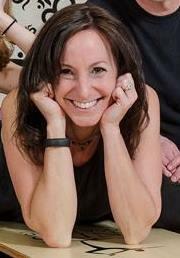 Holding Yoga Alliance and ACE credentials, she is currently a teacher trainer (CEC provider) for the Yoga Alliance, and the American Council on Exercise. She also instructs Pilates Reformer and Indo board Yoga. When Mary isn’t teaching or inspiring others to be centered beings — on and off of their mats — she enjoys spending time with her two fabulous children, Camille and Trent; taking yoga classes anywhere and everywhere; travel and the study and enjoyment of wine. She believes that taking yoga realistically off the mat and into the home and the community is where every person can make a sincere difference in the world. Visit Mary Elko Comfort for more information. This entry was posted in celebrity, honoree, Recognition, women and tagged education, excerise, fitness, Mary Elko Comfort, Monroeville, Move Yoga Fitness, PA, Pitssburgh, stretching, teaching, Today's Honoree, training, YogaFit. Bookmark the permalink.